Ashaman is one who serves his people by acting as an intermediary to the spirit world. The claimed ability to communicate with the world beyond death is at least as old as the time when early humans first conceived the idea that some part of them somehow survived physical death and existed in some other place in spirit form. The grief that came with the sorrowful thought of losing all contact with a loved one was lessened by the assertion of a fellow tribesperson that he or she could still communicate with the spirit of the one who lay in the grave. 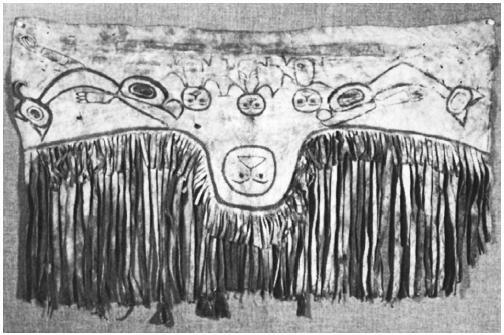 Among early humans, those individuals who claimed to be able to visit the place of the dead were known as shamans, and the messages that they relayed from the spirit world were sought by the elders regarding every major tribal decision. Originally, the term "shaman" was applied to the spirit doctors and exorcists of the Tungus of Siberia, but in recent years the title has been applied as well to the medicine men and women of the various North American tribes who also serve as mediums, healers, and visionaries for their people. Many tribal traditionalists still revere the wisdom that is shared by those men and women who maintain the shamanic traditions and who travel to the other side in the company of their spirit helper. 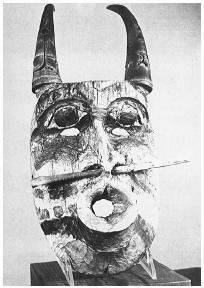 In the introduction to his book The Way of the Shaman (1982) anthropologist Michael Harner writes that shamans "…whom we in the 'civilized' world have called 'medicine men' and 'witchdoctors' are the keepers of a remarkable body of ancient techniques that they use to achieve and maintain well-being and healing for themselves and members of their communities." Harner states that shamanic methods are remarkably similar throughout the world, "even for those peoples whose cultures are quite different in other respects, and who have been separated by oceans and continents for tens of thousands of years." The anthropologist Ivar Lissner, who spent a great deal of time among the Tungus of Siberia, as well as native peoples in North America, defines a shaman as one "…who knows how to deal with spirits and influence them.…The essential characteristic of the shaman is his excitement, his ecstasy and trancelike condition.…[The elements which constitute this ecstasy are] a form of self-severance from mundane existence, a state of heightened sensibility, and spiritual awareness. The shaman loses outward consciousness and becomes inspired or enraptured. While in this state of enthusiasm, he sees dreamlike apparitions, hears voices, and receives visions of truth. More than that, his soul sometimes leaves his body to go wandering." It is believed that during those times when the souls of shamans go wandering, they project their consciousness to faraway places on Earth as well as to the shadow world of spirits. These soul journeys may inform those who seek their shaman's counsel of everything from where to find the choicest herds of game to how to banish a troublesome spirit from their home. 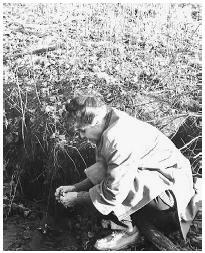 Those men and women who aspire to learning such techniques for themselves may pay a shamanic practitioner for the privilege of undergoing an arduous course of training that would include periods of fasting, going on vision quests, and encounters with the world of spirits—a regimen that may take the student many years to accomplish. In 1865, the great warrior Roman Nose, who had studied under the tutelage of White Bull, an elderly Cheyenne medicine man, lay on a raft for four days in the midst of a sacred lake. Roman Nose partook of no food or water, and he suffered a relentless sun by day and a pouring rain by night. But he felt none of these distractions, for Roman Nose was in a trance so deep that he appeared to be dead. When he returned from the Land of the Grandparents, the place of spirits, Roman Nose had obtained the necessary vision teachings to attack the white man's cavalry who were invading the Powder River country. On the day of battle, Roman Nose mounted his white pony and told the assembled warriors not to accompany his charge until the Blue Coat soldiers had emptied their rifles at him. The power that he had received from the spirits during his "little death" had rendered him impervious to their bullets. Roman Nose broke away from the rest of the war party and urged his pony into a run toward the ranks of white soldiers standing behind their wagons. When he was so near that he could see their faces, Roman Nose wheeled his mount and rode parallel to their ranks and their rifles. He made three or four passes before volley after volley from the soldiers' Springfield rifles. He remained untouched, unscratched. Finally a musket ball knocked his pony out from under him, but Roman Nose rose untouched and signaled his warriors to attack. They believed that magic he had received from the spirits kept him safe that day from all the bullets. While one can pursue the path of becoming a medicine man or woman by undergoing a vision quest, receiving a spirit guide, and serving an apprenticeship under the direction of an established medicine person, traditionally, it seems, the greatest shamans are created by spiritual intervention in the shape of a sudden and severe illness, spells of fever, epileptic seizures, or possession by tutelary spirits. It would appear that those who become the most effective intermediaries between the worlds of flesh and spirit must have their physical bodies purged and nearly destroyed before they can establish contact with spirits. Black Elk (1863–1950), the respected medicine practitioner/shaman of the Oglala Sioux, became a "hole," a port of entry for spirits to enter the physical world, when he fell terribly ill as a boy of nine. He heard voices telling him that it was time for him to receive his first great vision, and he was taken out of his body by two spirit guides who informed him that they were to take him to the land of his grandfathers. Here, in the land of the spirits, Black Elk received the great vision that was to sustain him all of his life. When he was returned to his body, his parents greeted the first flutterings of his eyelids with great joy. The boy had been lying as if dead for 12 days. term "hole," today's counterparts of the shamanic mission might say that they are spirit mediums or channels through which the power from the spirit world might flow. In many tribal societies, the pseudo-death, or near-death experience, appears to be nearly a precondition that must be met by those who aspire to the role of the most prestigious of shamans. In 1890, Jack Wilson, a Paiute who worked as a hired hand for a white rancher, came down with a terrible fever. His sickness became so bad that for three days he lay as if dead. When he returned to consciousness, he told the Paiutes who had assembled around his "corpse" that his spirit had walked with God, the Old Man, for those three days; and the Old Man had given him a powerful vision to share with the Paiute people. His vision proclaimed that the dead of many tribes were all alive, waiting to be reborn. If the native peoples wished the buffalo to return, the grasses to grow tall, and the rivers to run clean, they must not injure anyone; they must not do harm to any living thing. They must not make war. They must lead lives of purity, cease gambling, put away strong drink, and guard themselves against all lusts of the flesh. Jack Wilson's grandfather had been the esteemed prophet Wodziwob. His father had been the respected holy man Tavibo. Among his own people, Wilson was known as Wovoka; and now he, too, had spent his time of initiation in death and had emerged as a holy man and a prophet. The most important part of the vision that the Great Spirit had given to Wovoka was the Ghost Dance. The Paiute prophet told his people that the dance had never been performed anywhere on Earth. It was the dance of the spirit people of the Other World. To perform this dance was to insure that the Great Mystery's blessings would be bestowed upon the tribe. Wovoka said that the Old Man had spoken to him as if he were his son and assured him that many miracles would be worked through him. The native people had received their shamanic messiah. A crucial element in shamanism is the ability to rise above the constrictions and restraints of linear time. In his text for American Indian Ceremonial Dances (1972), John Collier comments upon the shaman's and the traditional native people's possession of a time sense that is different from the present societal understanding of the passages of minutes, hours, and days. At one time everyone possessed such freedom, Collier says, but the mechanized world took it away. If humans could exist, as the native people in their whole lives affirmed, "in a dimension of time, a reality of time—not linear, not clock-measured, clock-controlled, and clock-ended," Collier suggests that they should gladly enter it, for individuals would expand their consciousness by being there. "In solitary, mystical experience many of ourselves do enter another time dimension," he continues. But the "frown of clockwork time" demands a return to chronological time. The shaman, however, recognizes that this other time dimension originated "within the germ plasm and the organic rhythms…of moveless eternity. It is life's instinct and environment and human society's instinct and environment. To realize it or not realize it makes an enormous difference." Achieving a deep trance state appears to be the most effective way that shamans regularly abandon linear time restrictions in order to gain entrance to that other dimension of time. By singing their special songs received in vision quests or dreams, shamans put themselves into trances that permit them to travel with their spirit helpers to the Land of the Grandparents, a place free of "clockwork time," where they gain the knowledge to predict the future, to heal, and to relay messages of wisdom from the spirit people. Hirschfelder, Arlene, and Paulette Molin. The Ency clopedia of Native American Religions. New York: MJF Books, 1992. Steiger, Brad. Medicine Power. New York: Doubleday, 1972. Fodor, Nandor. Between Two Worlds. New York: Paperback Library, 1969. Bennett, Hal Zina. Spirit Animals and the Wheel of Life. Charlottesville, Va.: Hampton Roads Pub lishing, 2000. Steiger, Brad. Totems: The Transformative Power of Your Personal Animal Totem. San Francisco: HarperSanFrancisco, 1997. Hirschfelder, Arlene, and Paulette Molin. The Encyclopedia of Native American Religions. New York: MJF Books, 1992. 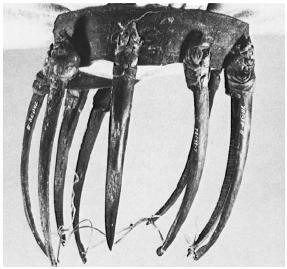 The first picture of the shaman's headdress is upside down.